The ultimate price of Marxism is striking its deep blow into the very heart of Western Society. We are about to learn the VERY same lesson that both Russia and China had to learn. You cannot control society through its economy by dictating prosperity. President Karolos Papoulias of Greece has come out and made a very blunt and dire statement that EVERY Western government will be pushed into the brink before they too will have no choice but to repeat these same words: “We are faced with a societal explosion if any more pressure is put on society,” said Papoulias. Greece is the canary in the coal mine. All we need do it watch. Greece’s 1.35 million unemployed are unable to make ends meet and this is manifesting in protests and riots. However, there is also a growing number of those still employed who are struggling to feed, heat and clothe themselves. The solutions have been austerity by cutting spending and forcing the people to pay ever a burden of increasingly hefty taxes. These policies ONLY support the credit rating of the country for the bondholders. They are destroying the threads that made people come together in the first place to form society. Government has simply abandoned the people and is only focused on its own survival. This is HOW nations always collapse. Nations historically are destroyed by debt. It is this reason that both the Arabs and the Catholic Church had forbid lending money for any interest. If you lent someone money, it was to help them – not to enslave them. But the power to offer future spending power today has been far too great a lure that always entraps every society. Greece’s largest union, the GSEE, has called a general strike to protest a new series of austerity measures. It warns that the labor force, which includes a large public sector, has been too badly weakened to help the battered country recover. Greece’s problem has always been taxation. There never should be any DIRECT TAXATION for it simply drives capital away. Only INDIRECT TAXATION, as the founder of the United States provided, would preserve liberty and restrain the growth of government. Since Greece was priced out of the international debt markets in 2010, it has relied on emergency loans from other Eurozone countries and the International Monetary Fund (IMF). However, in order to continue receiving these loans, Greece had to agree to harsh spending cuts and tax hikes to lower its public debt. These measures, like those the misguided policies of the Great Depression, have slammed the brakes on Greece’s economy precisely as was the case during the Great Depression. In both cases, politicians, focused only upon the bondholders, turned against their own people to sustain their borrowing ability. When the European commission came to us, we warned bluntly that unless the debts of each member state were consolidated into a European federal bond market, there would never be stability for the euro as a single currency. 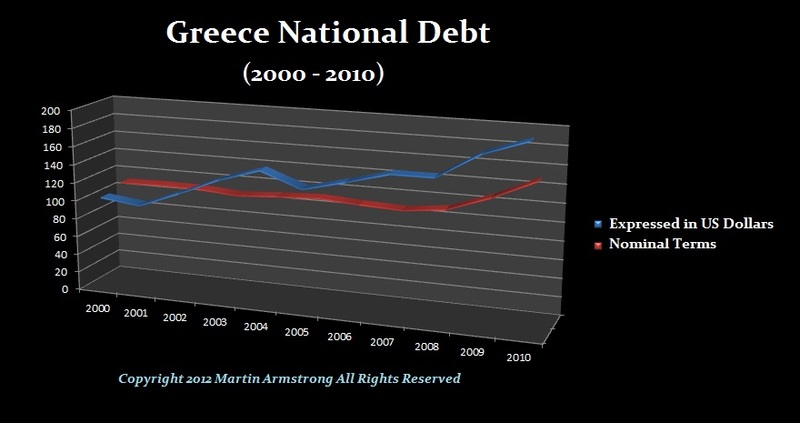 Here is a chart illustrating the REAL reason why Greece failed. It was NOT the spending of the government in nominal terms. The critical issue became the rise in the Euro from about 80 cents to $1.60 on world markets. This meant that in international value terms, the Greek debt virtually doubled. The rise in the debt starting in 2008 is not dissimilar to anything else we see in the budgets of all nations. The Greece with nearly 11 million people has been stuck in a 5-year recession with no end in sight UNLESS there is a major structural reform that will include dealing with the debt. Greece now has the highest unemployment rate in the 17-strong group of European Union countries that use the euro, with 27 per cent out of work. Like Spain, about 60 per cent of those who are chronically unemployed are less than 24 years old. There is no choice BUT for major civil unrest and perhaps a revolution. The crisis, sparked by the failure of politicians to ever understand the dynamics of the economy, has left 450,000 households with no one working at all. The one-year limit on unemployment benefits and strict rules to qualify for them has produced only about 225,000 jobless Greeks who are currently receiving any monthly state assistance. We are talking about massive starvation thanks to the stupidity of politics that has been dominated by lawyers who think they need only write a law and everyone must comply. Those in government, are blind to their own stupidity. Greece has also experienced a shocking rise in the suicide rate as people just cannot cope with a future darkened by the ignorance and refusal of politicians to reform. Crime is rising as people are driven to steal from the supermarket just to feed their family. According claims of unions, two-thirds of employees in the private sector no longer receive regular pay. The large increases in taxes that Greeks have to pay, has demoralized the people and is destroying the future of the nation. We are looking at massive exportation of wealth through debt and interest payments to non-Greek lenders. The Greek government’s imposition of emergency taxes upon workers to help pay down its debts, is causing an economic meltdown. These emergency tax bills, often several thousand euros, have been matched with even further taxes levied on electricity bills. Households that failed to pay have been disconnected from the power grid. The government is imposing yet another round of tax hikes this year. Without urgent structural reform in the World Monetary System, what we see in Greece will be widespread throughout Europe and the United States. We are at the breaking point. Greece is NOT unusual. Greece has merely followed the economic doctrines that Volcker himself conceded have failed. If we do not look to Greece as the canary in the coal mine, we will destroy our own society and that of our properity. Ironically, this could all be fixed in 30 days or less. Unfortunately, Government would rather destroy everything in hopes of maintaining the status quo. Greece is on the edge. We will all be there soon. We are observing what happens when the tax capacity is used up. Lawyers never get this. This think there is no limit to the power to tax. That false assumption is destroying civilization.